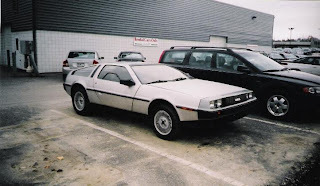 Last spring, a DeLorean turned up in the back service lot at New Motors, the local Volvo dealer at the time (recently it changed hands). The car was last registered in the early 90s with a Penn State Alumni plate. Apparently the PRV engine was presenting some difficulties, presumably from sitting for an extended period. The car sat at the dealer for several months and I'm happy to report that I saw it on the road later on. Right after Rognac there is a huge, huge, huge lot of new Renaults. I'm not exactly sure but I think that whenever somebody in the region orders a new Renault, it gets sent from the factory to this lot and then to the dealer they bought it from. Two years ago I drove past and saw this Clio V6. Clios are everywhere and aren't particularly interesting but this one has a mid-mounted V6. It's to the standard Clio what the R5 Turbo was to the standard R5 back in the 1980s. They were produced in very limited numbers and are bound to become collectibles. 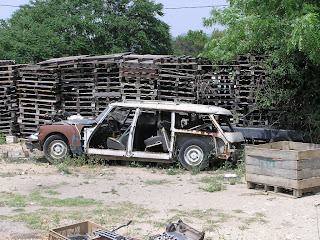 This Citroen Ami 6 was part of an entire field (possibly loosely organized into a junkyard) of mostly old French cars. With it were other French cars including a couple of Citroen DSs and some Renault Dauphines and other European 60s cars. I stumbled upon it on a Sunday trip with my family a couple of years ago and haven't been able to find it again since. This Autobianchi A112 Abarth has been sitting a few streets over for a couple of years now. The base A112 used the Fiat 850's 903cc (mounted in the front and transversally) but the Abarth variant of it used either a 982cc or a 1050cc, depending on the version. This Alfa Romeo Romeo 2 is sitting in a field in the south of France. Sitting along with it are a couple of Citroen H vans, some Peugeot 403s, a Citroen Ami8, an Alpine A110, a very rare Alpine A106, etc. Unfortunately, none of the cars are for sale and none of them are in very good shape. This Romeo 2 is a rare find. They were produced in limited quantities in the 60s. The drivetrain is similar to the Renault Estafette: front wheel drive with the motor derived from a production car (the Giulia/Giulietta in the case of the Alfa). Some went to the Italian military, some were used as ambulances, while others were used by Alfa dealers and racing teams. Few (like this one) were ordered by private owners who used them as campers or work vans for their businesses. Just an FYI, I've turned on a word verification type of thing for leaving comments because we were starting to get people posting spam. Hopefully this will take care of it. When Seat introduced their Ibiza in 1985, they claimed the drivetrain was developed in collaboration with Porsche. This was supposed to generate interest in the car which, to be honest, had little other selling points. So the advertising campaigns boasted the "German engineered engine" and "SEAT-PORSCHE" was prominently displayed on both sides of the car. In reality, it wasn't a Porsche engine but it had a Porsche designed intake and "PORSCHE" displayed on the valve cover. It was available in either a 1.5 or a 1.2 liter. I saw the one pictured below in a junkyard here two years ago. Before Volkswagen got involved in the 1980s, Seats were rebadged Fiats produced under lisence (or lackthereof, in the case of the Fiat Ritmo/Seat Ronda) in Spain. Today they're moving away from badge engineering and designing their own cars while still using Volkswagen chassis/drivetrains. This Seat 124 was parked in Barcelona and is a good reminder of the Fiat days. Another testament to Swedish build quality. This is a Volvo 264 GL that is one PSU student's daily driver. While taking these pictures I met the owner of this car. He informed me that this brick is on it's second engine and transmission. The old PRV V6 was replaced by a more reliable 240 unit and it's been converted from an automatic to a 4 speed. Interestingly the grille designates it as a diesel, though it's never been one. To quote the line from the movie Crazy People, "Volvo. They're boxy but they're good." 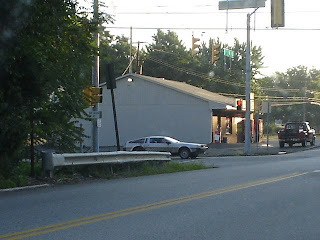 Anyway, in State College there is someone who uses this Fiat Strada as a semi-daily driver. I have yet to see it yet since the winter has gotten bad (unless it's desintegrated since then from salt). Really it's in pretty good condition considering how often this car is driven and that its not necessarily one of the most reliable products to come from the country of Italy. Still, I'm glad to see it out there. There arn't many people who care about entry level Fiat sedans from over 20 years ago... especially not in the US. Do barn finds have to be parked inside of barns? I'm sure this vintage VW bus would disagree. It's located (or it was located) north of Ann Arbor, Michigan, on one of the numerous scenic and winding roads of Washtenaw county. Not too much to say about it - there's little to say that's not better told by the photos. The last two shots show my old 1975 BMW 2002 parked in front of the barn. That's one of two cars that I wish I'd never sold... the other was a very rusty '86 Alfa Romeo Spider Graduate, my first "fun" non-daily driver (though I often used it as such). Though the van shows a 1979 Michigan plate on its front bumper, the one on the back is much newer. I spotted these Toyota FJ-40 Land Cruisers in the back parking lot of Toyota of Ann Arbor. These classics were all low mileage, but rusted absolutely beyond belief thanks to what appeared to be continual use as snowplows. I wouldn't be half surprised if they had been used for 25 or 30 years. The photos should speak for themselves. These old Cruisers are rare sights and it seems that fewer and fewer are preserved. Those that don't wind up as hacked up four-wheeling monsters rust away into nothingness. At least these colorful 4x4s are being used, I suppose. This 1969 Renault 4 isn't your everyday Renault 4. Pop open the hood and you'll notice the battery takes up only half the tray. It's a 6 volt. Second thing is that it still has a 3-speed manual as opposed to the 4-speed that later models came with. 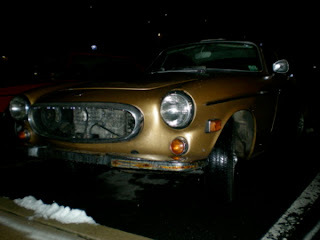 The car itself was apparently owned by an elderly gentleman in the Nice area until 2002 when a guy bought it with the intention of restoring it. The restoration never started and it sat in the new owner's driveway. One day he noticed a pool of coolant under it and never started it again. The first owner took real good care of it. He always kept seat covers on it, he had the floors replaced when they started to rust (big issue with these cars) and he kept the original odometer when he replaced it. Add up the two odometers and the car only has 73,000 kilometers! The tires are dry rotted, the brakes are seized and there is some damage on the passenger side where somebody scraped it against a wall but overall, this car has a ton of potential. Believe it or not, this 1975 Citroen DS23 did run when it was parked. My great uncle got it in the early 1980s as payment for some work he did. Even though it was only a couple of years old at the time, it was already in bad shape. Being a carbureted 23, it had the bigger 2300cc engine and was horrible on gas. Lastly, he already had a DSuper 5 he bought new in 1973. The DSuper was in much better shape and got better gas mileage. A combination of the above meant the car rarely got driven. Eventually it was parked and it started to deteriorate. By the late 1980s it had become a parts car. I've got a lot of good memories from this car, playing it in as a kid and all. But, my great uncle is now dead, my great aunt is tired of looking at it and his son (who inherited the DSuper, which is in like-new condition) has pulled just about everything worth pulling from it so it will be scrapped within a few weeks. There's not much else we can do with this one. Alright, it's not a car. But a Fendt 930 Vario was featured on an episode of Top Gear and was called the Mercedes S-Class of tractors. This is only the 920 so lets call it... mm, the E-Class. Anyway, since Penn State is the most expensive state university in the nation, they would be able to buy their Agriculture students superlative machinery to play around in the dirt with. Enter the Fendt 920 Vario that was found in the parking lot outside of my dorm. It was on display one afternoon along with a John Deere and a few people were standing about examining this German schlepper. It really is quite a machine. Complete with Hella lighting and a transmission system that wouldn't seem out of place in an Audi - though maybe if it were a little higher geared and maybe made of aluminum. But as far as tractors go, this one is quick. It can push 40mph! While driving through campus here at Penn State, I found a vehicle that I normally wouldn't expect to see on a saturday night sitting in a college parking lot in a wintry mix of precipitation. 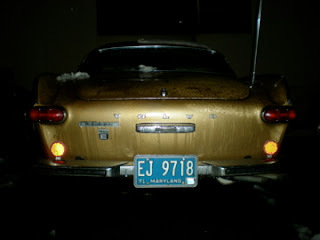 It's an early 70s (71 perhaps according to the vintage Maryland plate) Volvo P-1800 E Automatic. It appears to be in largely original, unrestored condition. Paint looks original and there's some rust popping up in the fenders to go with it. 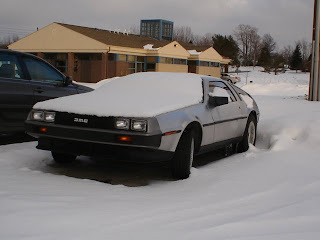 I'm not sure if I'm happy to see the car being driven or if I'm depressed to see it weathering away in a Pennsylvania winter. Perhaps it had a good reason to be out that night. Either way, it's a testament to the build quality of these old Volvos. Road test: 1997 Fiat Brava. In 1995, Fiat replaced its Tipo with the Bravo and the Brava. The Brava was a five door sedan and the Bravo was a three door sedan. This particular article will focus on the Brava but both models got the coveted European Car of The Year award in 1996. How does that distinction hold up twelve years later? Let's find out. It's a very spacious car inside. The dashboard is neatly layed out and everything is easy to get to and operate. The glovebox doesn't lock which is a small concern when you leave it in a parking garage every day. The cloth seats are a touch on the firm side but very supportive. The build quality inside is surprising for a Fiat. The trunk is much larger than you'd expect, you can fit a fair bit of stuff back there. The back seat is adequate as well-- two full size adults can sit there comfortably. The C pillar creates a huge and potentially dangerous blind spot, it would have benefitted from an extra window. Under the hood lies a 1.4 liter inline four cylinder mated to a 5-speed transmission. The whole package is mounted transversally and turns the front wheels. Fiat never offered a 6-speed which is a shame. At 130km/h (speed limit on French highways, which any person who was driving in the 1970s and 1980s will complain about) in 5th, the engine is running about 4,000rpm.. if for no other reason than to keep gas mileage down, a 6-speed transmission should have at least been offered as an option. The car is fairly quick considering the engine size. It handles pretty well too, you can have some fun with it on curvy backroads. Where this car really shines though is on the freeway. Unlike some of its predecessors, it's very stable at high speeds, making it an ideal car for long freeway trips. However, and I hate to say this, but it's a ten year old Fiat. It's not as reliable as some of its competitors, namely the Peugeot 306, though I believe it fares better than the Renault Megane of the same era. There are no major problems with it, just little things (especially of an electrical nature) that nickel and dime you. All in all they're a good value in the used car market but they're hard to find in decent shape and their resale value is next to nothing. But if what you're looking for is cheap and relatively recent point A to point B car you can toss around every now and then, the Fiat Brava/Bravo duo is worth a look. Road test: 2006 Renault Modus. The Renault Modus is a bit of an enigma in Renault's lineup. Introduced in 2004, it's built on a Clio platform and was mainly introduced for two reasons: 1) to give buyers a four door alternative to the at-the-time aging Twingo and 2) to give buyers a roomier alternative to the Clio. The second void has since been filled by the Clio Estate. When it was introduced, its biggest selling point was how many storage bins it had. In that respect, it doesn't disappoint. It has storage space under the front seats, where the speedometer should be (read on), under the front floormats, etc. The glovebox is refrigerated which is a good way to keep your lunch cool. While it can fit four people more comfortably than a Twingo, it can't fit more of their gear: the trunk isn't much bigger than a Twingo's. The build quality inside is subpar, both in the materials used (very cheap feeling plastic) and in how it's screwed together. The driver's power window goes up in increments of maybe two centimeters at a time and it only has 15,000 kilometers. The seats are uncomfortable on anything but a short drive. The backseat is okay for two adults but three is very cramped. The dashboard is huge and since you have the option of sitting up high (by moving the seat up), the visibility of the road ahead is very good. The speedometer/instrument cluster isn't behind the steering wheel, where carmakers from all over the world have put it for the better part of the 20th century, but in the middle of the dash like a Mini's. Another peculiarity is that instead of having a classic speedometer, it just has an orange LCD display that displays your speed with a number (i.e. 38.) Some drivers may find that handy or futuristic-- I find it particularly annoying. The steering is one of the high points of this car. It's soft at low speeds which allows for easy parking and gets harder as speed increases which is nice in contrast to the over-assisted at any speed steering you find in a lot of new cars. Firm steering doesn't make it a sports car. Far from. It's powered by a rev-happy 16-valve 1.6 liter 4-cylinder (also found in the Twingo and the Clio) and has a 5-speed manual transmission. On paper, that sounds like a promising package but it's disappointing. The car is far from fast (even for the type of car we're dealing with here) and not particularly pleasant to drive. Driving it, you're not tempted to test its limits. It's meant to be driven in a very relaxed manner. Your only reward for this is good gas mileage. On the freeway it's iffy at best. Unlike the Fiat Brava, this is not the kind of car you would take on a long freeway trip. Even at 110km/h it doesn't feel very stable and because of its height, you're at mother nature's mercy should there be crosswinds. To sum it up, it's an average at best car if you're planning on doing mostly city trips and if you get a new car every couple of years. I don't see it as a viable option as a long term car or if you do a lot of freeway driving. As mentioned above, it's not a comfortable car for long trips and the mediocre-at-best built quality ensures this car will be plagued with issues in ten or so years. I absolutely adore Renault and I'm a big fan of a lot of cars they've made in the past but for the most part they messed this one up. Note: this is now the last generation Modus. Renault barely came out with a refreshed one which I have not yet driven. A long wheelbase variant of it is now available which should help it gain some needed trunk space. ..but a Jagst 770! These were made under lisence by NSU in Germany. Rare sight today, especially in France. This 350SE is ending its days in an apartment complex's parking lot in Aix-en-Provence. 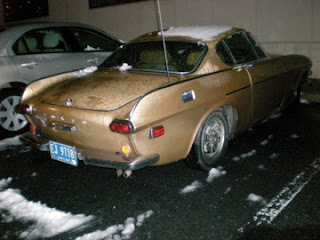 Sad to see a car that was one of the most expensive cars on the road in its day end up like this. I saw these two Renaults on a recent trip through the Vaucluse region. The second one is a late 1960s Renault 6. An interesting car because the Renault 6 came out in 1968 and the lisence plate (blocked out here out of courtesy to the owner) puts it in the 1969-1970 range so it's a real early model. Much like 4s, a lot of these have been scrapped. It's ending its days watching modern Renaults made out of plastic drive past at 130km/h on the freeway. Today before all the superbowl madness, I was out and about in the State College, PA area looking around at some of the local car dealerships and shops. Of note were two interesting Mercedes Benz products. The first- what appears to be a 1990's 300 GE that is a definate grey-market import. Complete with tacked on side marker lights that look as if they came off of a 280 SE and a substitute VIN number plate tacked to the inside of the A-pillar. 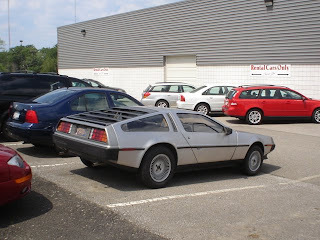 This was found at the local Saab, Mazda (and other US made crap) dealer. Also of note at an independent foreign car shop in town was a late 50s, or early 60s Mercedes Benz 219 in a rather decrepit state of affairs. It appears to be a permanent fixture in their back lot. It was last registered in 1999 in North Carolina.